Managing Enterprise Server is done in a Web browser by making use of the various Maintenance pages that are available for performing a specific task. These tasks include setting up a Brand, managing users, creating custom metadata properties, and more. Menu. Displayed on the left side of the page, this area contains a menu of all available Maintenance Applications. The lower part of the area contains a Log Out button, your user name, and the installed version of Enterprise server. Main area. The area on which the Maintenance page is shown. Figure: The main screen of Enterprise Server. A. Menu bar B. 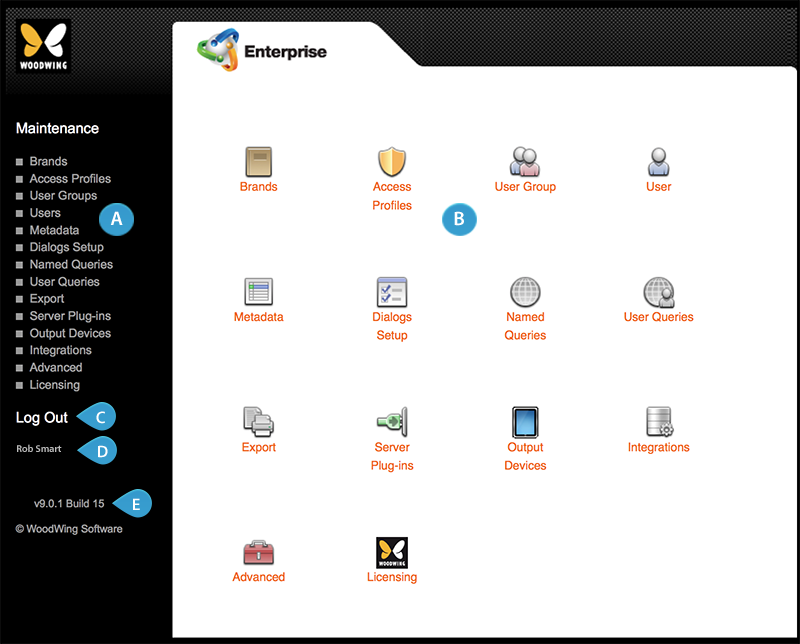 Application page, here showing the Home screen C. Log Out button D. User Name E. Enterprise Server version. When logging in, the Home page is shown, showing all menu items in the form of an icon. Note: This page can be displayed at any time by clicking "Maintenance" at the top of the menu.